Here I am preaching at the marriage conference I conducted called “Keeping Your Marriage in Tune: Singing the Song of Solomon.” Roddie Taylor, the pastor of the church we worked on, said, “Talk straight to our people.” And I did. But it resulted in some very intimate and personal questions asked back dealing with marriage and all its aspects. 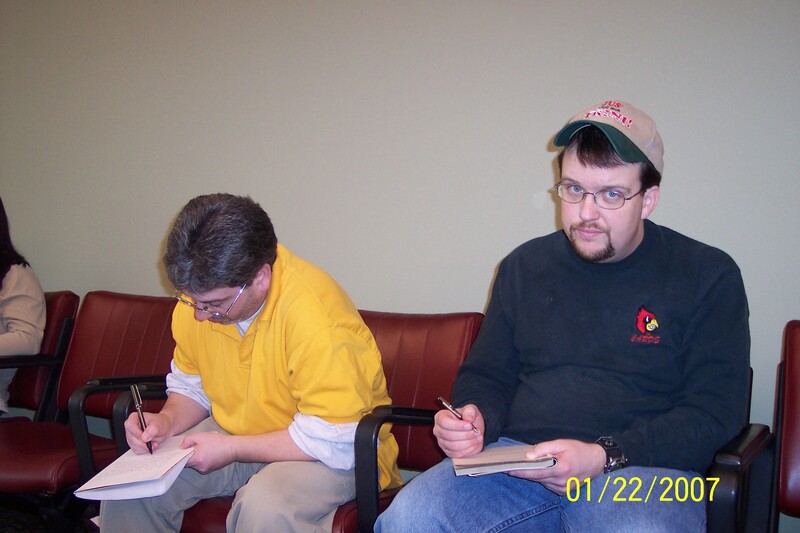 As we waited and waited and waited in Lexington for our flight to leave. Scheduled to leave at 11:00 a.m., it left and 12:50 p.m. and almost made us miss our flight to Port of Spain. Wow! Sometimes, the Great Commission isn’t always a smooth road. Last month, after ordering Arturo Azurdia’s book on Spirit-Empowered Preaching, I went to his website (http://www.spiritempoweredpreaching.com) and downloaded his four-part series from the IFCA Pacific Northwest Regional Conference in Port Angeles, Washington — and listened to them while in Trinidad. While the book was quite good, the sermons changed me. We had a successful marriage conference at First Baptist San Fernando this past Friday and Saturday. Forty-three were in attendance and we had some good feedback and questions during the conference. But we praise God that this Sunday morning during a three-hour service where I preached on Mark 14:1-11 at Mt. Beulah Evangelical Baptist Church in Point Fortin, one man named Theophilus gave his life to Jesus Christ. Glory to God and God alone! We are going to the southwest portion of Trinidad this afternoon and various places tomorrow, so keep us in prayer. We plan to be back in Lexington at 4:00 p.m. on Tuesday. Pray all the flights go smoothly. After almost missing our connection due to the late flights out of Lexington, KY, we made the connection with seconds to spare and made it to Port of Spain, Trinidad, smoothly. The flight was just over four hours from Atlanta. Customs and immigration were no problem. We made it to Point Fortin around 11:45 p.m. and got to work right away the next day. Some of the tile at the church was already laid. Here are some pictures to give you an idea. Here is the title on the platform of the sanctuary at the church in Point Fortin. Here is am cleaning away the”mud” overflow which seals the tile to the floor so the other men could begin laying the next row of tile. This is Aaron and Panther. Aaron has no legs and he and Panther laid down the tile quickly and expertly. We hope to send you some more pictures so you can really see the difference. It’s an Extreme Church Makeover. This is Kasia, Roddie’s granddaughter. She has grown up so much. When we first went in ’04, she was only eight months old and barely walking. Now, she is growing up, running, talking, and being queen of the castle like always. What a sweet child. I have an interview today at the Christian radio station in Port of Spain at 4:00 p.m. today (3:00 p.m. EST) concerning the marriage conference I’m conducting this weekend, so please pray. Roddie Taylor, the pastor here, was to be in on the interview, but he is ill so I have to do the fifteen minutes solo. Please pray for me. God is high above all the nations and is not tied to any culture. We praise God that even those we Americans are in Trinidad, God is with us as well. That we would be a faithful witness on the airplanes, in the airports, at in Trinidad. An old friend e-mailed me about the current series on expository preaching and he made a good point about dealing with the text that reinforced this particular part: deal with the “problem texts” directly — don’t hover over them. He’s right. You see, “problem texts” are so because the problem lies within us, not the text. Calvinists will breeze over 2 Peter 3:9 and maybe even John 3:16 because these texts do not on the surface conform to their theology (although, I believe, a case could be made — but I digress). Arminians have a problem with Romans 9:14-18, so they breeze over this text by applying it only to Israel and not as part of God’s covenant plan throughout history. Our Bible should affect our theology, not vice versa. Our theology must arise out of the principles and doctrines outlined in Scripture. Otherwise, why not just preach from Grudem’s Systematic Theology? Only the Scriptures are inspired (breathed out) by God. It’s called the Greatest Show on Earth — and, no, I am not talking about Barnum & Bailey’s circus. Some have said it is much like Mardi Gras on caffeine. The week before the season of Lent, which is a season of fasting until Resurrection Sunday (Easter), the country of Trinidad and Tobago engages in a celebration known as Carnival. With its massive masquerade bands, astounding costumes, pulsating music and unparalleled stamina for partying, Trinidad & Tobago’s Carnival is often described as the world’s greatest street festival. In 2007, the annual Carnival season climaxes on Monday, February 19th and Tuesday, February 20th, when thousands of costumed revellers take to the streets to “play mas”. For the fun loving people who live in these sun kissed isles, Carnival begins in earnest on Boxing Day when the fetes (parties) go non-stop until Carnival Sunday. It is during this period that calypso tents open their doors to the public and cultural shows, from limbo competitions to massive soca concerts, begin. An explosion of colour, music, revelry, and creativity, Trinidad and Tobago’s Carnival has spawned similar celebrations around the world; but nothing on earth can rival the abandon, euphoria and stunning spectacle of our festival. Carnival in these islands has evolved over 200 years from a celebration enjoyed exclusively by French plantation owners, to an enormous event that equally embraces people of every colour, creed, class and background. Larger than life, the festival defies simple explanations. One word that many in Trinidad use to describe this festival is the word ‘bacchanalian.’ Much lewdness and debauchery accompany this festival. It is for that reason that many churches do not participate because the activities there indulge the flesh so badly that their message would be lost. Some try — but are overrun by the party. It is no coincidence that we are traveling to Trinidad in January. When I went to Trinidad last year to conduct a leadership conference, one of the sessions dealt with the leader’s family. I opened it up for questions, and we spent more time talking about marriage and family issues than we did with the actual lecture portion. Why? Because people want to know what God says about these issues. They are begging for someone to come over to Trinidad and help them. We have a tradition at our church (and someone defined a tradition as anything in a church that is done more than once). That tradition is this: if we have a team going on mission — whether to Trinidad or New Orleans or WorldChangers or any other team that God sends from our church — we as a church will commission then with our prayers and our support to advance the Kingdom of our Lord Jesus. We must not misunderstand the purpose of these services. We are not here to simply exalt the five who are going. We are following a biblical pattern where churches under the guidance of the Holy Spirit send with God’s blessing. Why do they go? Because the Holy Spirit reveals to men and women of God the need to help that land know the Good News of Jesus Christ. 1. We cannot initiate a spiritual work — only God can (Acts 16:6-7). Paul had plans. Yet Paul’s plans never overrode the plan of the Holy Spirit of God. During Paul’s first missionary journey with Barnabus. They traveled various places in Asia Minor. Yet, Paul’s plans were firmly grounded in God’s plans. Paul’s conversion and calling to the Gentiles came from the Holy Spirit revealed from heaven. And we see that when this calling came about that on his first missionary journey during a church service. In Acts 13:2, “While they were worshiping and fasting, the Holy Spirit said, ‘Set apart for me Barnabus and Saul for the work to which I have called them.” The Holy Spirit of God is the one who commissions. So they went to Cyprus, Antioch Pisidia, Iconium, Lystra, Antioch in Syria, then back to Jerusalem. Prior to the second missionary journey, something which seemed rather unspiritual happened. And after some days Paul said to Barnabas, “Let us return and visit the brothers in every city where we proclaimed the word of the Lord, and see how they are.”  Now Barnabas wanted to take with them John called Mark. But Paul thought best not to take with them one who had withdrawn from them in Pamphylia and had not gone with them to the work. And there arose a sharp disagreement, so that they separated from each other. Barnabas took Mark with him and sailed away to Cyprus,  but Paul chose Silas and departed, having been commended by the brothers to the grace of the Lord. And he went through Syria and Cilicia, strengthening the churches (Acts 15:36-41, ESV). This disagreement over the value (or lack) of Mark caused Paul and Barnabus to split. While on the surface, this is tragic, but God actually used this to multiply his ministry but sending two teams in two directions. Yet, just as the Spirit opens doors (to God be the glory), so too does the Spirit close those doors (to God be the glory). We cannot manipulate the work of God. It’s just as much of a sin to try to go where God has said no than to not go when God says go. Paul understood this principle. He knew from his studies in the Old Testament that when Israel went into battle without the presence of the Lord, defeat occurred because his favor did not go before them. Every preacher has a favorite subject on which he loves to preach. I remember hearing an example of this when someone preached on the Fall of Man. He told his congregation, “I’d like to talk about the rebellion against God, the reaction of God — and a few words about baptism.” Some preachers love to preach on evangelism, the end times, Calvinism, and many other popular topics almost to the exclusion of every other topic. Pastors are under great temptation to keep their situation smooth. To use the vernacular, pastors simply do not want to “rock the boat” unnecessarily. The thoughts of introducing a subject of controversy on Sunday morning where most members and visitors attend would be out of the question. Yet, expository preaching guards us from being a Johnny One-Note. Allow me to give a personal example. The day was August 20, 2006 — a special day in our household, for I had the blessing of baptizing Hannah as she publicly responded to Jesus Christ as her Lord. I was in the midst of preaching through Romans 8. That morning, not only did we have a number of family and friends visiting, but we also had a large number of general visitors as well. In the midst of this series, I found that August 20 would have me preach on Romans 8:26-30. As you may have noticed, a number of lightning rods are in this verse: foreknew, predestined, among others. I noticed though that by preaching expositionally, the people expected me to preach from that text. If I did not, they would have immediately seen this and realized that I did not want to tackle this subject. It ultimately would have undermined my credibility in preaching, saying in effect that I would not preach the whole counsel of God. So, in essence, this model of preaching not only forces the listeners to address certain issues, but it also forces the minister to address some issues as well. When preaching through 1 Corinthians, preachers have to deal with church discipline when you approach chapter five. When preaching through Romans, you have to deal with the implications of election and predestination in Romans 9. When preaching through Joshua, you have to deal with the rationale behind God sending Israel to wipe out an entire tribe or nation. (The reason being is that God exacted justice immediately during that era.) Otherwise, you would avoid these sticky issues. By tackling them with prayer and the power of the Holy Spirit, you give your people food by which they may be nourished and show them that the Bible speaks to every issue and is entirely relevant. So preach expositionally! Preach the Word! Walter C. Kaiser Jr. serves as president and Colman M. Mockler Distinguished Professor of Told Testament at Gordon-Conwell Theological Seminary in South Hamilton, Massachusetts. He is the author of numerous books and publications, as well as one who serves on the board of many Christian organizations. Kaiser’s purpose for this book is to bridge the gap between the hermeneutics and homiletics departments of our Bible colleges and seminaries. It is hoped, then, that this volume will be useful to those who are already in the pastorate and who are struggling week after week to resolve just this problem. But the main object of our work must be the scores of those men and women who are currently enrolled in Biblical and theological studies at the collegiate or seminary level (22). Kaiser desires this work to be a “type of firstfruits to the Church at large … [to] either rectify the situation with a good theory of exegesis” (22) in bridging the gap between hermeneutics and homiletics, “or to drop all professional pretensions from our Biblical and theological departments and offer only research-oriented degrees leading to teaching and writing posts in academia” (23). Kaiser divides Toward an Exegetical Theology into four parts. Part I presents Kaiser’s introduction to this work. This chapter deals with the decline in the area of hermeneutics to discover the authorial intent of the text from the Puritan age until the present. Kaiser notes the “crisis of the pulpit” (36). Far too many pastors ignore the Old Testament, deem the Old Testament irrelevant, or only relate it through the eyes of the New Testament. 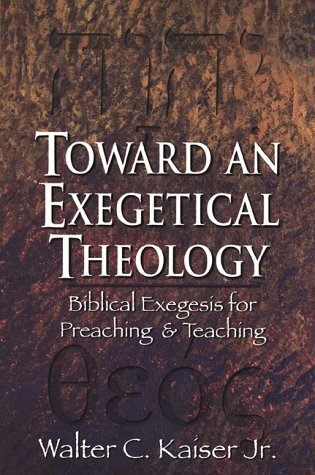 Chapter Two deals with the definition and history of exegesis. Kaiser states, “The sole object of the expositor is to explain as clearly as possible what the writer meant when he wrote the text under examination” (45). This statement for Kaiser defines exegesis, and then methodically takes the reader through the various eras and stages of exegesis through church history. Part II, entitled “The Syntactical-Theological Method,” contains six chapters dealing with various types of analyses which connect syntactical issues with biblical theology. Chapter Three addresses contextual analysis. “Good exegetical procedure dictates that the details be viewed in light of the total context” (69). Chapter Four deals with syntactical analysis and the various literary structures in Scripture such as prose, poetry, narrative, wisdom, and apocalyptic literature. “Each of these literary forms has a distinctive shape and style; accordingly, the approach to each form must be modified to meet its particular needs” (91). Within these forms, he notes that “the unit of concern must be the paragraph” (95) for paragraphs help the reader understand the flow and the theme of the ideas presented. Chapter Five addresses verbal analyses. Kaiser states, “Words and idioms are the most basic of all the linguistic building-blocks of meaning” (105). He notes the importance of noting the surrounding words in understanding that word’s meaning. Chapter Six addresses theological analyses, which Kaiser calls “the missing ingredient in most sermon preparation” (131). He notes “exegesis is never an end in itself [but] must come to terms with the audience as well as with what the author meant by the words he used” (149). Chapter Seven then deals with this stage of preparation in dealing with homiletical analysis — an area which in Kaiser believes theological education has failed. In this chapter, he presents to the reader “’Preparations for Homiletical Usage’ [where] the basic thrust of the chapter will be … principlization,’ the final task in the exegetical process” (150). Part III outlines special issues in expository preaching such as the use of prophecy, narrative, and poetry respectively in chapters nine, ten, and eleven. Kaiser notes in chapter nine that while preacher should preach prophetically, he must take care not to preach solely against institutional and cultural structures. Old Testament prophets made their primary appeal “to the individuals who made up those communities and institutions” (187). In chapter ten, Kaiser notes, “What is needed in preaching on … narrative portions is some method of pointing out the abiding meanings and continuing significance for all believers” (197). Chapter eleven outlines how to preach Old Testament poetry expositionally, directing the preacher to know how “parallelism … is the dominant stylistic feature” (212). The conclusion of this work is found in Part IV. Chapter 12, entitled “The Exegete/Pastor and the Power of God,” serves as the last chapter of this work and possesses a pastoral tone to the expositor in seeking the Holy Spirit for his power in the pulpit. “In all good conscience point to the presence of the Holy Spirit as the source of any confidence that we might have in our message even after we have acted most responsibly in the study and preparation of the text for proclamation” (235). As stated earlier, Kaiser’s aim in this work is to help bridge the gap between the hermeneutics and homiletics departments of our Bible colleges and seminaries in the area of biblical exegesis – and he succeeds! In the preface, Kaiser believes that in order for one to be a proper exegete of the Scriptures, he could not “hope to begin unless and until he is able to translate the text from Greek to Hebrew” (9). He grants though that many pastors, teachers, and missionaries are not able to partake of these educational opportunities. Given these issues, Kaiser notes that “the method expounded in this book can be profitably employed even if one has access only to a translated version of the Scriptures” (10). Kaiser finds a tremendous balance in providing solid help for those in all levels of biblical scholarship. Kaiser’s work rightly advocates allowing the Scriptures to develop the framework for the preacher’s and the listener’s theology. First, he addresses in Chapter 1 the current crises in exegetical theology and notes the “yawning chasm between understanding the content of Scripture as it was given in the past and proclaiming it with such relevance in the present” (18). Kaiser notes, “We contend that the theology must be objectively derived from the text; not subjectively imposed on the text by the interpreter” (137). These impositions on the text also happen with narrative passages. He understands the temptations many preachers face and addresses them directly. “The exegete must resist the temptation to impose a mold over the text by forcing that text to answer one of his favorite questions or to deal with one of the contemporary issues that our cultures wants to have solved” (153). His solution to this temptation involves determining the theme of each paragraph, looking for repeated terms which are stressed or defined, and looking to see what how these paragraphs fit into the overall book or section in which they are found. This theme runs continually through this work, reinforcing this all-to-important principle that the Christian’s theology must arise from the text. He rightly believes that a procedure must be in place to help understand the core meaning of the text will the preacher derive his theological framework. The interpreter accomplishes this analysis through studying the terms, events, quotes and covenants found in the text, engaging in a “full involvement of Biblical theology as part of our exegesis” (137). To begin with, let it be stated as a sort of first principle that preparation for preaching is always a movement which must begin with the text of Scripture and have as its goal the proclamation of that Word in such a way that it can be heard with all its poignancy and relevancy to the modern situation without dismissing one iota of its original normativeness (48). He provides a helpful history of exegesis. Though this overview is not as comprehensive as Sidney Greidanus’ overview in Preaching Christ from the Old Testament (Eerdmans, 1999), its inclusion in this chapter immediately the section on the definition of exegesis bolsters Kaiser’s argument concerning the nature of good exegesis. For instance, Kaiser defines exegesis as seeking to “identify the single truth-intention of individual phrases, clauses, and sentences as they make up the thought of paragraphs, sections, and ultimately, entire books” (47). As he examines the five stages of Christian history, Kaiser wonderfully extracts the positives and negatives that arise from each stage of history and shows the lesson that deviating from authorial intent takes the interpreter down a problematic path — all the while showing the worthwhile intent behind such a method. He presents both sides, yet does not give too much ground to the incorrect view. The preacher and exegete will benefit from such a balanced presentation. Another strength with Kaiser’s work is his use of humor and metaphors periodically in his explanations. This book contains technical information about the study of exegesis, so by Kaiser using humor and word pictures, he allows the reader slightly unwind as he absorbs the content. For instance, in chapter five in his discussion on verbal analysis, he discusses the importance of the surrounding words in determining the specific meaning of a word. With levity, he notes, that “words, like people, are known by the company they keep” (106). Another example is found in Chapter 6 when he uses a stirring metaphor in describing the trained clergy’s failure to connect biblical texts to today’s situations and their “Achilles’ heel” (131). The inclusion of these word pictures among the norm of dry, academic language that so pervades these types of works. With the strengths found in this volume come the weaknesses. The most glaring weakness is the placement of the contents of chapter twelve. The topic of this chapter addresses the exegete/pastor and the power of God. In a quote above, Kaiser noted that for the pastor, the Holy Spirit is the source of confidence in our message regardless of the number of steps taken in preparation. Considering the importance of the presence of the Holy Spirit, Kaiser should have placed this chapter toward the beginning of this book rather than at the very last chapter. Jesus did not say, “Proper sermon preparation and exegetical work will teach you all things.” Rather, Jesus says in John 14:26, “But the Helper, the Holy Spirit, whom the Father will send in my name, he will teach you all things, and bring to your remembrance all that I have said to you” (John 14:26, ESV). Kaiser fully agrees with this verse. Given this sentiment, the placement of such an important understanding at the very end of this work is puzzling. While Kaiser notes the importance of biblical truths guiding one’s theology, he strays from this philosophy not once but twice in reference to the same passage: 1 Corinthians 14:34-35. In making the point that the exegete should pay “close attention to each subtle nuance that may aid us in detecting sectional divisions” (77), he proceeds to engage in extra-biblical speculation. He wonders aloud, “Could it not be that the debated passage of 1 Corinthians 14:34-35 is a quote from Rabbinic law?” with no rationale on how he arrived at this point. He then proceeds to connect this passage with other passages from 1 Timothy 2:8-11 as well as 1 Corinthians 11:4-5. He also addresses these same verses on pp. 119-120, apparently to show how to apply the principles of verbal analysis. Kaiser violates his own principles for confuses Paul’s admonition in 1 Corinthians 11:4-5 with men and women who pray during their own private worship with principles Paul lays out for public worship in 1 Corinthians 14:26-35. I would highly recommend Kaiser’s work as a good starting point in understanding how to construct a sermon that bridges the ancient text of Scripture to contemporary times. He correctly diagnoses the issues facing the contemporary preacher and then proceeds to help the preacher in a methodical fashion overcome the obstacles facing him in dealing with Old and New Testament exegetical problems. The pastor and seminarian will benefit greatly from the groundbreaking contribution.